Millennium 7 Publishing Co.: Social Selling To Build YOUR Client Relations? 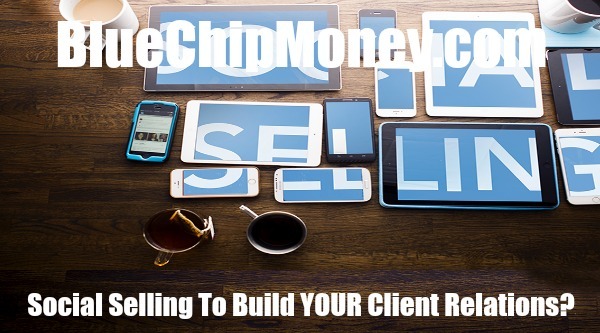 Social Selling To Build YOUR Client Relations? What is social selling and how can you use it to build your client relationships? "I don't connect with clients on social media." That's the response many investment advisers give when I ask what they're doing around social. It can feel uncomfortable to risk messing up and getting it wrong, and finance is an industry where compliance rules abound. Yet my advice is to focus on what can go right with social media, not on what can go wrong. You need to be using social media. Call it social selling. It is not a replacement for traditional, proven selling practices, but in today's world, you have no choice but to incorporate it into your daily life as an adviser. Social selling is the art of using social networks to find, connect with, understand, and nurture sales prospects. It's the modern way to develop meaningful relationships with potential customers that keep you --- and your brand -- front of mind, so you're the natural first point of contact when a prospect is ready to buy. Think of an active social media presence as an effective and persuasive extension of your personal brand. Who are the financial customers of the future? Generation X and Millennials. Over the next 30 to 40 years, $30 trillion in financial and non-financial assets is expected to pass from the baby boomers to their heirs. Women. From the RBC Wealth Management Women and Wealth Transfer Report 2017: Women are the critical decision-makers in matters of family wealth and educating their children about money. They take a collaborative approach to financial knowledge and management, looking to a broad range of sources for advice and support. How can social selling help secure relationships with the customers of the future? Social media is a client attraction tool. Your brand reputation is the draw. A strong brand reputation is attractive. Personal brands are becoming as powerful as corporate brands. Influencers are carrying more and more weight due to the viral nature of social media. The business of wealth management has become similar to the business of luxury brands. David Dubois, INSEAD Assistant Professor of Marketing, wrote: "The digital world has levelled the playing field and given these individuals sometimes more sway and energy than an entire brand. Their followers can count in the millions. By pushing their own content and speaking in their own name, influencers appear more authentic and trustworthy than corporate brands. Social media is a communication tool to meet people where they are. The customers of the future embrace modern communication. And social media lets advisers know how these customers think, what their interests are, and what scares them. This can help us to educate our clients on their terms, their preferred platforms, and on their own devices. 1. What are you trying to accomplish in your career? 3. Who do you need or want to meet? "Gen X and millennials don't start with the same level of loyalty and trust. They are looking to find out how they can benefit, and they will want to have your help with networking." Social media has changed how customers inform themselves about investment opportunities, how they find people to manage their money, and how they communicate with their investment advisers. Salesforce's recent blog "The Biggest Differences Between Cold Calling and Social Selling" has some great tips: "On social media, you're playing the long game -- offering ideas, sharing insights from others, and offering feedback that proves you're genuinely relevant to the person you're trying to attract." April Rudin, global wealth management strategist and founder of the Rudin Group, said: "There is no right way and there is no wrong way to use social media. You have the grand opportunity to put forth ideas that are unique to you. This gives prospective clients a chance to get to know you before they meet you in person." As Rudin eloquently explained in her recent blog post, The Forgotten Generation X, "Embracing technology and communicating your unique value proposition are winning strategies no matter your target generation." Guest Authored By Barbara Stewart. Barbara is a researcher and author on the issue of women and finance. She recently released the seventh installment of her "Rich Thinking" series of monographs. Previously, Barbara worked as a partner and portfolio manager with Cumberland Private Wealth Management. She's a frequent interview guest on TV, radio, and print, both financial and general interest, as well as a former columnist for Postmedia newspapers in Canada and the Mrs. R website. Follow Barbara on Twitter. Having a strong online presence will make you more of a draw.